With the holiday season fast approaching we’ve started taking particular notice of holiday-themed photos in our collections. These photos can vary from Whistler Mountain ski instructors dressed up as reindeer to Santa finding hidden powder to Season’s Greetings from the Philip family. One of the more interesting holiday photos shows a roasted turkey in a wood burning stove called “Master Climax” (so named for the make of the stove). This stove was part of the kitchen set up at the first Toad Hall, one of Whistler’s most famous (or infamous) lodgings. This Toad Hall was built by Alta Lake resident Alf Gebhart, who first came to live in the area in 1936. In the mid-1960s, Alf sold his property to Charles Hillman, a high-school teacher working in Vancouver. Charles, in turn, rented his property to a “respectable-looking” father with two daughters. The rent was paid consistently and on time, though after a while the names on the cheques started to change. By the time Charles Hillman decided to start using his cabin to ski, unbeknownst to him, the property had been renamed Toad Hall and was gaining a reputation across the country. Charles arrived to find a young resident from Montreal cooking breakfast, evidence of a campfire in one of the bedrooms, and sleeping quarters set up wherever possible, including the chicken house. The first Toad Hall, 1969. Benjamin Collection. With help from the RCMP in Squamish and a court order, the residents of Toad Hall were amicably evicted, with enough time given for a farewell party. By the 1970s, the Soo Valley Logging Camp, near the northern end of Green Lake, was no longer in use by the forestry industry. This became the second incarnation of Toad Hall. Perhaps the best known image of Toad Hall, the Toad Hall Poster, was taken here. That spring, knowing their time there was limited, residents gathered with their ski gear and little else for a memorable photo shoot set up by photographer Chris Speedie – 10,000 copies of this poster were printed and sold for two to three dollars each. Copies were distributed along the World Cup ski circuit by Terry “Toulouse” Spence. Over the decades, copies of these posters became harder to obtain. Then, in 2013, Terry brought a box to the museum. The museum officially sold out of the original run of Toad Hall posters this past January, almost 45 years after it was first printed. The first official reprint of the Toad Hall Poster is now available to purchase at the Whistler Museum. Although the Toad Hall poster’s infamy has persisted through the years, it became harder and harder to get your hands on one. Until 2013, when Toulouse himself came into the museum with a box of the original, 1973 print, posters that are still in mint condition. You can now get yourself one of these absolute classic pieces of Whistler history for yourself, available exclusively from the Whistler Museum! This is the story of Whistler’s most famous photo, created on a whim one care-free spring afternoon four decades ago. 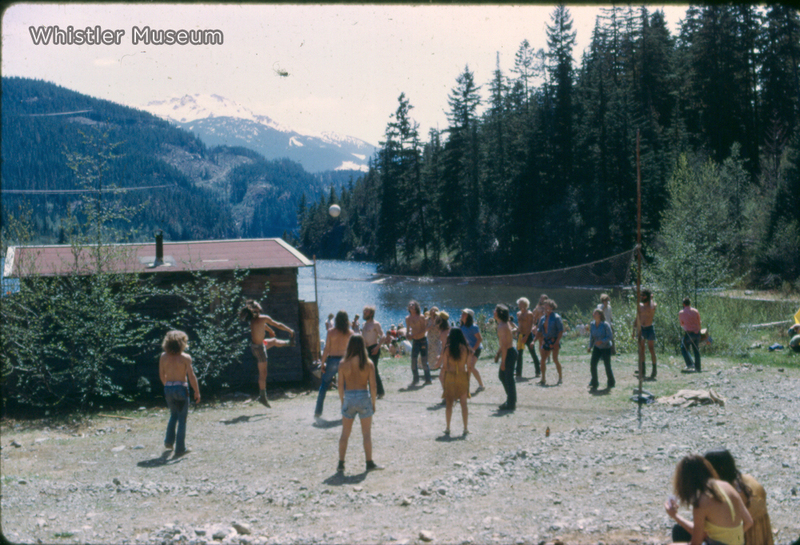 1973 in Whistler was another era. Less than a decade earlier, the construction of ski lifts on Whistler Mountain had put the previously quiet fishing resort on the map, attracting an influx of youthful, free-spirited ski bums. Meanwhile, Whistler Village, Blackcomb Mountain, the Olympics and other major development remained little more than a pipe dream. Heck, many locals still lived without electricity or running water. Throughout the valley the ski bums lived in a wide variety of hand-built cabins, and conveniently vacated structures, perhaps none more revered than Toad Hall. Enjoying an idyllic volleyball match along the shores of Green Lake. With a mere $75/month lease (for the property, not per person), this collection of wooden shacks near the north end of Green Lake, formerly known as the Soo Valley Logging Camp, came to be a focal point of the revelrous ski bum community. Without going into too much detail, let’s just say that by the spring of 1973 tales of debauchery left local powers wholly unenthused with this shag-carpeted Shangri-la. Toad Hall was slated for demolition later that summer. One sunny spring day, whoever was milling about was asked to convene out front with their ski gear, but wearing nothing else. The photographer, Chris Speedie, orchestrated the photo simply to provide residents with a memento before Toad Hall met its demise. The completely uninhibited and playful posing perfectly captured the spirit of the times. Later, sensing the image’s iconic potential, a few “Toadies” scrounged together some cash and printed off 10,000 posters. At 2 or 3 bucks a pop, guerilla poster sales funded abundant “apres” sessions for years to come. The poster’s mastermind, Terry ”Toulouse” Spence, also worked for the Canadian National Ski Team. During the height of the Crazy Canuck era, Toulouse brought boxes of posters along for the ride on the World Cup ski circuit. To this day it can still be found decorating the walls of some of the world’s most cherished ski bars. Despite the annotation in Kitzbuhel’s famed Londoner Bar, this is not “Canada’s National Ski Team”. The poster simply provides an unencumbered gaze back in time at early Whistler’s care-free lifestyle. And yes, some of the “models” still call Whistler home, but good luck getting any of them to admit it! 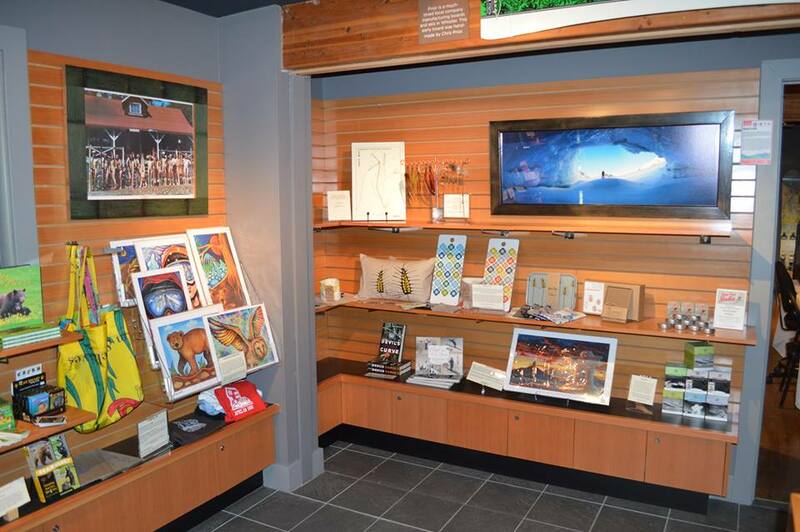 The museum’s gift shop, with the Toad Hall display poster on the left.